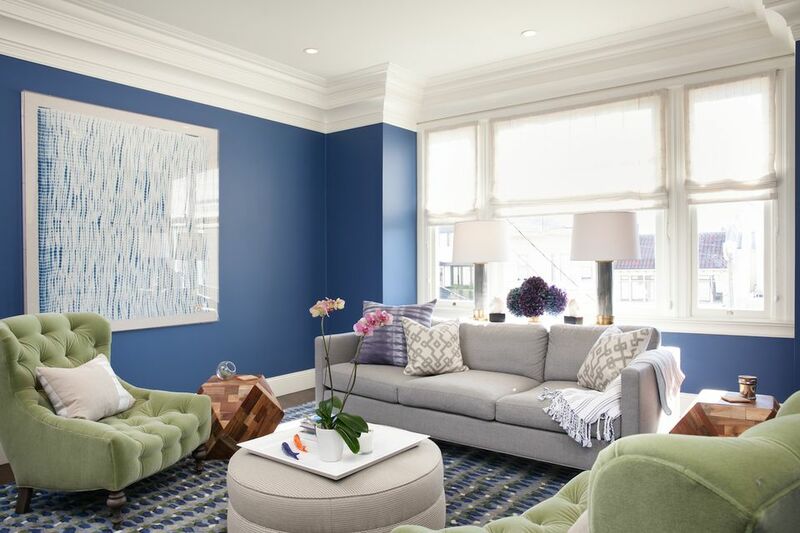 A focus on bespoke, vibrant homes, interior designer Kari McIntosh takes us inside her latest project - a modern family home in the Russian Hill neighborhood of San Francisco. The project had a tight deadline as the family of soon-to-be three needed a designer who could help them complete their newly renovated home just two months before their first child was about to be born. Under a strict deadline, McIntosh was able to design a home that's warm, colorful and perfect for a young family with a newborn on the way. "I worked quickly to curate a fashion-forward and family-friendly home fit for a young family that loves wine, sports, and entertaining." McIntosh started with a blue and green color palette in the living room. A choice of furnishings and art lends to the rich palette that's warm and cozy, perfect for a family that desires a stylish environment. The home's dining room has an open plan right into the kitchen. A mix of color and texture creates a striking statement in the dining area. The dining table is burled wood. A beautiful, natural wood tone that's warm and inviting. Surrounding the table, a set of modern classic Panton Chairs add some soft curves. On the wall, green malachite wall art is the perfect pop of color. And overhead, the modern chandelier is the perfect way to bring home some ambiance. For a sophisticated environment, McIntosh is a master at mixing different genres in a space in perfect harmony. Take the kitchen's breakfast nook for example. A Platner dining table and red farmhouse chairs look perfect together with the upholstered banquet seating. The kitchen is cool and contemporary with stark white cabinetry and stainless steel appliances. A trio of wood bar stools are perfect for warming up the environment. "These clients were so much fun; focused to push the traditional envelope as modern as possible and with a love for all things sophisticated and fashionable," says McIntosh. That shows in every room of the home, including the bedroom. Cool gray walls keep things modern. A tufted blue bed adds a tailored look. On the floor, a culturally-inspired rug grounds the space. Above the bed, a photograph of the ocean is perfect for a home by the Bay. "Furnishings and finishes were selected so that the majority would arrive for move-in with the understanding that a few key custom pieces would install after the fourth trimester." Under a tight timeline, McIntosh was able to complete the project and a perfect nursery for the newest member of the family. The nursery was designed in a calming palette of beige, off-white and wood tones. Unique furnishings were brought in, including a custom cabinet framed in brass. The home's cozy feel continues in this space as well. McIntosh carried the design aesthetic up to the ceiling. The added texture brings a sense of warmth into the room. A tufted element has been brought into the nursery as well. Beside the glider, a buttoned ottoman becomes perfect for relaxing moments with a little one. The final vignette in the room, shelving that's been styled with books and toys for the new arrival. With a neutral color palette as the backdrop, a collection of children's toys are a lovely pop of color in the space.